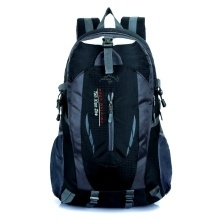 This backpack is made of high-quality nylon, water-resistant and tear resistant. It has a total capacity of 30L to hold all your travel essential. It is breathable, comfortable and lightweight, good choice for both men and women in their outdoor activities like camping, hiking, traveling, backpacking, climbing, etc. High-quality nylon fabric, water-resistant and wear-resistant. Roomy main compartment for your tablet, phone, clothes and essentials. External pockets and side mesh pockets for water bottles and small items. Strong attachment system to carry more items and keep them handy. Adjustable mesh shoulder straps help reduce burden. Breathable mesh backing for ultimate air flow and heat dissipation. Adjustable chest and waist belts to secure the backpack in place. Good for outdoor activities, like Camping, Hiking, Running, Cycling, Traveling.